Peace making like apathy is infectious, but only one makes earth as it is in heaven. The big problem with peace making is that it doesn’t always leave you feeling satisfied. We live in a world that promises instant gratification, and if you can’t have it now it isn’t worth it. Why would you choose the way of peace that might cost, when retribution, or retaliation has an instant if only short lived high. We have bought into the deception that peace is something that can be forced into existence with bullets, laws, or intimidation. The problem with this mentality is that anything but genuine peace, isn’t really peace. Growing up my twin brother and I were occasionally terrorized by our older sibling. There were times when we were able to exact our revenge, and for a brief moment feel victorious. The problem was that the lull in our conflict was usually my older sibling reorganizing his thoughts and looking at the calendar for the next time mom and dad were away from home. Peace is not an ends as much as it is a means. Jesus says ‘Blessed are the peace makers, they will be called children of God’. Jesus didn’t say blessed are the peaceful, but instead those who are in the act of creating peace. This peace creation is hard work, which is why so many leave it untried. True peace always has a price. As we watch the life of Jesus demonstrate the very things he taught, the price for the peace he offered was his own life. Peace making is an investment in the future not just in the present. One of the reasons I think real peace is so hard to find in our world is that for many they just don’t believe in it anymore. I recently had a conversation with someone who introduced herself by saying she was an Anabaptist but believed there is a time for war. I was taken aback by the odd placement of her statement. It was as if she was trying to get something clear right up front. Puzzled I asked her if she thought there was a time for greed, or for hatred. She didn’t see the connection. I tried to explain that just because destructive actions seem inevitable we should never give them a place at the table. When you say you believe there is a time for war you are already justifying it as an outcome. War like hatred or greed is never justifiable, yet is a part of our world. As a follower of Jesus I am confronted with these realities every day, and hope that they confront me with the desire for a better way each time. If only more people actually believed that when Jesus said ‘blessed are the peace creators’, that it is an invitation into a way of living. There will be a cost to this activity but as my mom always taught me, nothing good comes without a price. I know that there is always a tension in solving conflict with love. There is always a chance that those you have extended grace to won’t care and our actions will have been in vain. But we aren’t tasked with peace creation because of a guaranteed outcome, we are peace creators because that is what our heavenly father does. We are called children of God not because of our success but because of our effort. And a genuine effort comes when it is something you believe in. You only believe in peace when you recognize it has value even without obvious victory, and your efforts alone overcome the ease of destructive thoughts and behaviours. Perhaps this is why we don’t see enough peace on a global level because we don’t believe in it on a personal one. I wonder if more of us were engaged in the creative act of making peace in our lives, if we would see it more in our world. What if we saw peace as more than just a desired end. What if we understood Jesus’ words as a posture for living regardless of outcome. Like Leo Tolstoy who was convinced that this peace message of Jesus was a key, that needed to be firmly inserted into the door in order to open up the rest of Christ’s kingdom message. Perhaps it is a secret that could wake the Church out of its slumber and into the business of our father. Something peculiar happens when you are engaged in our fathers kingdom, you see him at work. It is amazing when you start believing in the way of peace again-how you begin to see the efforts of other people. This discovery gives us opportunity to celebrate it when we see it. Perhaps this is a second key to earth as it is in heaven. If the first one is apprenticing in our fathers peace making business, the second could be discovering all the places God is showing up in peaceful ways. Imagine praising someone for their patient response to a drunken patron, or thanking someone for their kindness to you after their treatment of your mistake. To believe in peace is to also be aware of it’s existence. Perhaps that is part of what is missing in our world is that there aren’t enough people to see that the answer lies around us. That the Kingdom has come, and it is lived out through the lives of those who believe in it, and worship it’s king. So lets become a people of hope again, not just for what happens after this life, but for the opportunities in it. Let us be about our fathers’ business and find satisfaction not merely in outcomes but in our peaceful posture. And may we discover that God is and has been at work in this peace business under the guise of neighbours and and strangers. What would happen if we caught a glimpse of God at work. Would it change our world if we discovered the kingdom in the actions of those not aware that God is using them to make earth as it is in heaven? 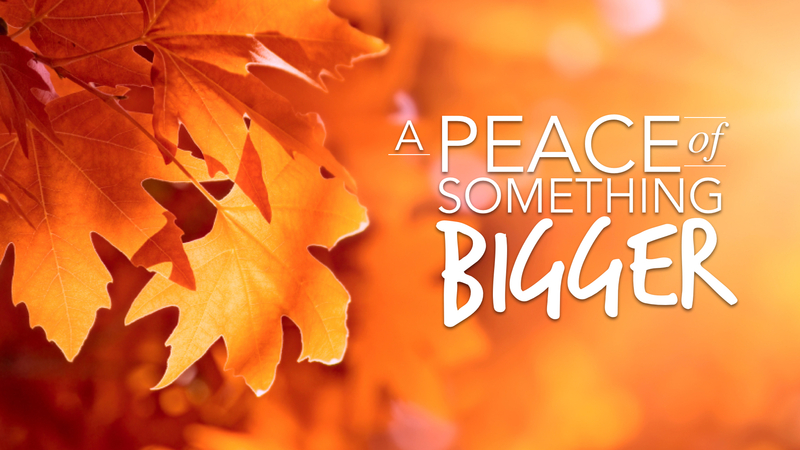 I think it certainly helps to live like we all are a peace of something bigger. This is one of the best posts I have seen on peace making! Amen:) Imagine if we lived the sermon on the mount! thanks for your encouragement, I couldn’t agree more. thanks for your encouragement, it is nice to know I am not alone in this big world.